Programmable, digital and manual thermostats each offer their own set of pros and cons for your air control. For your HVAC system to operate optimally, you need a thermostat adjustment. Thermostats are used to turn on or off your air conditioning system and keep you comfortable. 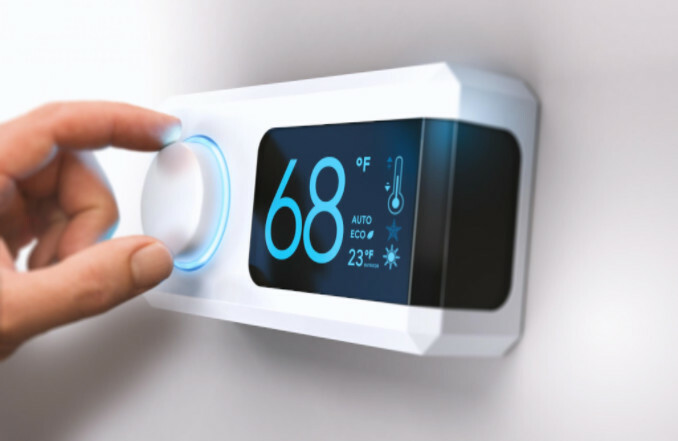 Thermostats gives you the freedom of dictating the particular temperature you want and, when used responsibly, it can become your greatest ally in helping manage your utility bills. However, before buying a thermostat, it pays to get the one that will optimize your cooling and heating use. Thermostats come in two basic types: low-voltage and line-voltage. The low-voltage system uses gas, electricity or oil – best suited to controlling the current of air. These thermostats are ideal for unitary power systems and water heating systems. A low-voltage thermostat makes it easy to monitor the airflow and ensure you have an accurate, current control. It operates between 24V and 50V. The other model type is the line-voltage thermostat used in single heating systems. In this type, the current flows through the thermostat into the heater. Unfortunately, using this type of thermostat becomes a little hectic since the thermostat can attain the necessary room temperature setting and shut off before heating the room. In addition to these two types, thermostats also come in one of three different options. When deciding on a thermostat for your own home, it pays to do your homework before deciding on which one will make the most of your HVAC energy. Programmable thermostats comes in two distinct settings: a seven-day option and a 5+2 day option. The seven-day option gives you programmed settings every day throughout the week, while the 5+2 provides you with the same setting for weekdays and a different setting for the weekend. Both options are programmed to change the room temperatures at given hours during the day to give a variation of daytime and night. Programmable thermostats allow you to program and set your temperatures to meet your demands at particular times. For instance, if you are not in the house during the day, you can program your HVAC system to save energy by working on a low setting while you are gone. Then you can set the temperatures for a future time in anticipation of your return. Mechanical thermostats manually adjustable throughout the day and they come in various types and shapes. Some are specifically designed to heat, while others do both heating and cooling. While mechanical thermostats are easy to adjust and use, they are unfortunately not able to switch automatically from heating to cooling. This means there could be some unnecessary energy costs if you aren’t diligent. Electrical thermostats are an improved format of the mechanical thermostat. Some have advanced features that make them more convenient and reliable. This type of thermostat has an LCD set point and temperature display that allows you to program your temperature to your satisfaction. Some digital thermostats have changeover capabilities ensuring your room maintains a particular temperature setting every time, and you can use this type of thermostat for heating or cooling. Although this kind of thermostat is a little more costly compared to mechanical models, it is convenient and reliable for everyday use. With all the types of thermostats available, you must be sure which type is compatible with your HVAC system. Buying the wrong gadget may cost you much to install and fail to deliver the results you desire. Therefore, it’s recommended to consult with a licensed HVAC contractor to avoid any possible mistakes. If you believe your home is in need of a new thermostat, Richmond’s Air can help. Our Houston-based HVAC service professionals can help you install a brand new thermostat or just give your old one a tune-up. Contact us today to schedule an appointment.